Image is available as a coloured image or Black and white! I have used the coloured image on this card. The challenge over on my challenge blog is: use lots of green! 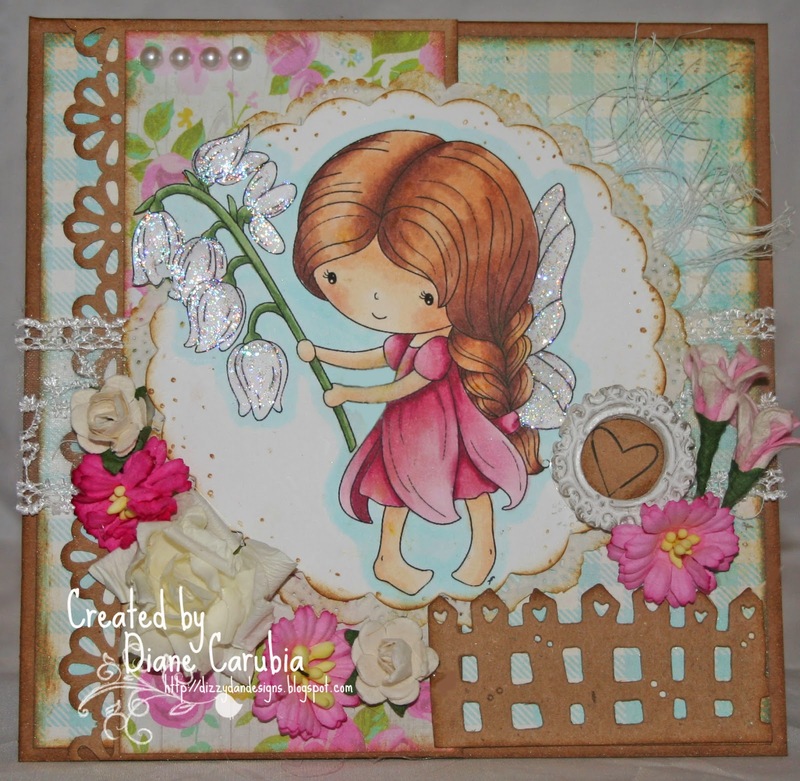 I have coloured her with copics used some stampendous distress embossing powder the most of the flowers are from Wild orchid crafts and the distress resin corner is from Live and love crafts.... i love the embellishment from this store! The round doily die is from my local craft store, sorry i cant remember the make, the papers are from a Nit wit pack! Well i said i wasn't blogging anymore but i will occasionally post cards that i find i am happy with and share with you today a technique i saw on TV using a cloth with some texture, dab with the cloth with copic Blender then dab onto your coloured image, it lifts off the inks leaving a mottled effect, of course i did use some dotting aswell with the pens but i will be trying this again!! Both images from my store coloured and B&W. Hope you like the cards, Happy Valentines day!! I have decided to stop posting on this blog for a while. My cards will be shown on my website, i find it a little difficult to keep up with posts with drawing aswell. I will keep this blog open so i can access all my lovely followers blogs. Our new challenge this week is HALLOWEEN! 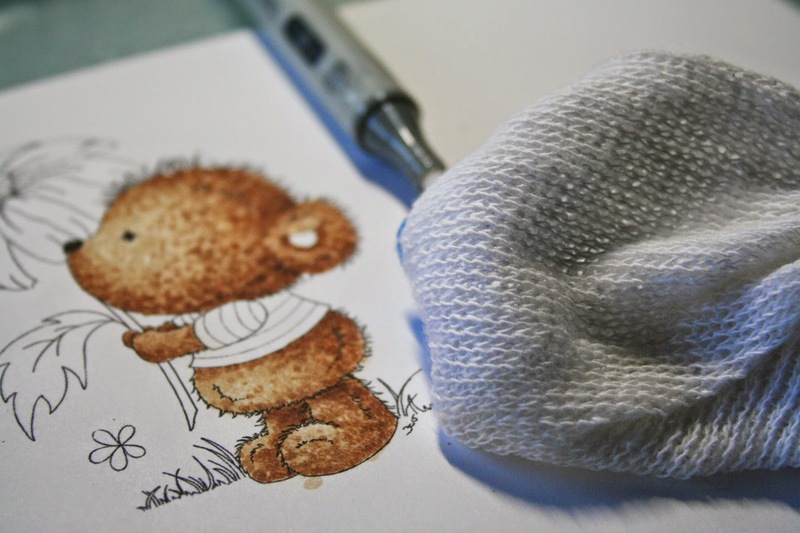 there are lots of wonderful images available at DI'S DIGI STAMPS that will be great on your creations, so you will definitely want to go check it out:) Can't wait to see what you make!! 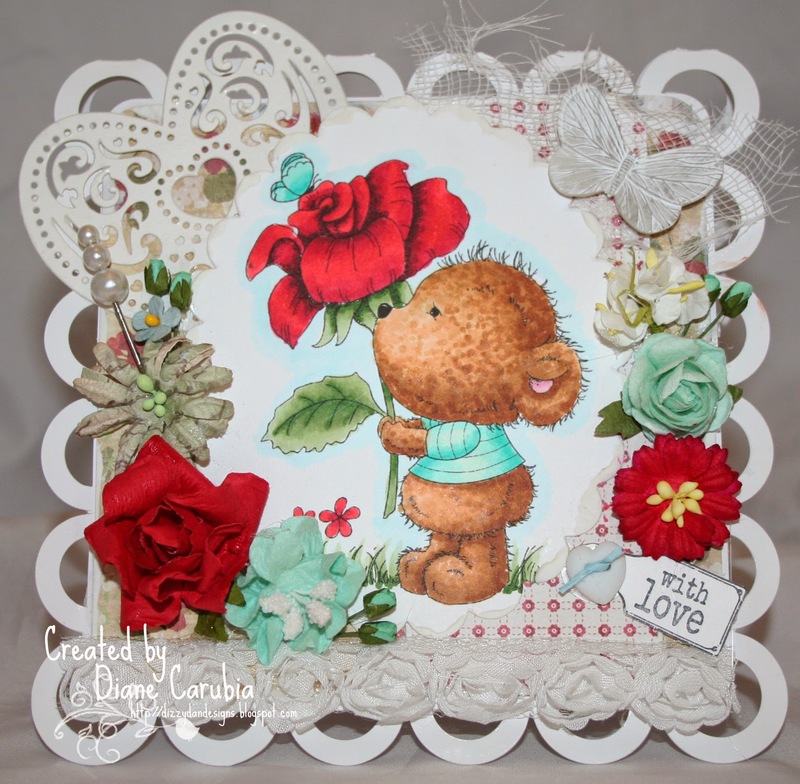 My card is made using my image Batty Bear and coloured with copics. 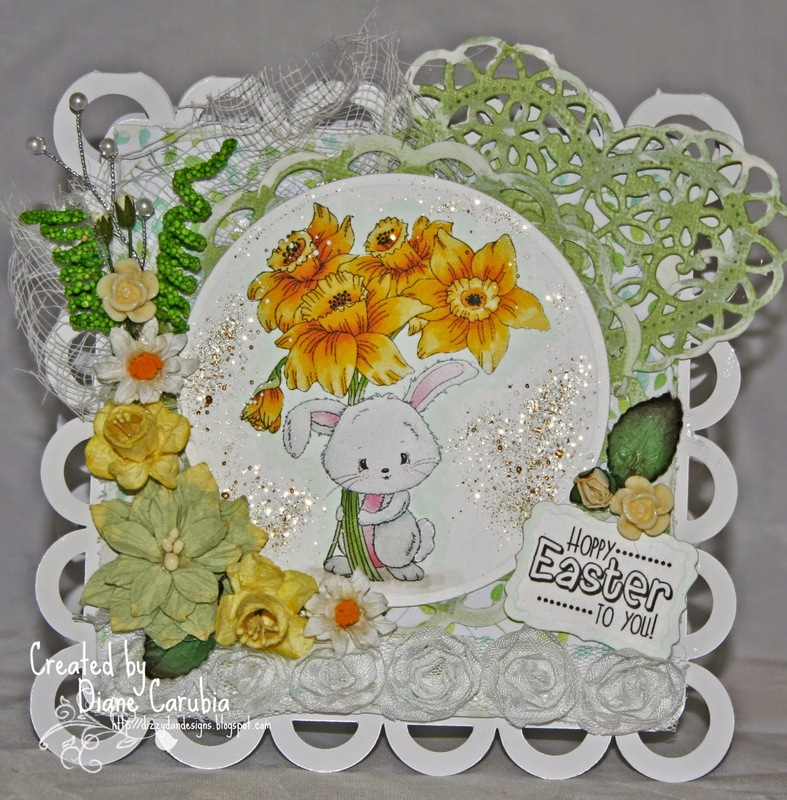 I tried designing some paper for this challenge as i couldn't find any in my stash so here is my first attempt which i have used as the background for my card. 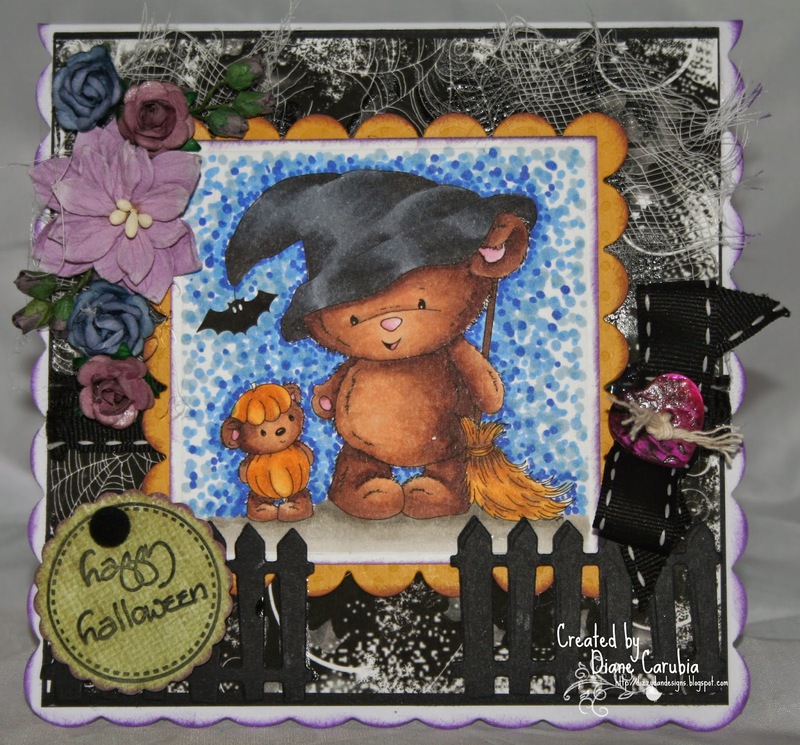 Please go and join in the Halloween fun over at my challenge blog!! Our new challenge this week is MYSTICAL CREATURES - fairies, mermaids, unicorns, anything magical. and coloured with copics.I have used the nitwits collection papers and a dies by La la land crafts that i got at my local stamp fair. The little love circle is from Melissa Frances embellishements.The silver corners are from my local craft fair and i have used lots of distress crackle paint ( picket fence). 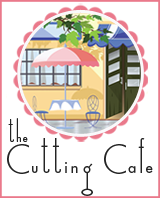 Our FABULOUS Sponsor this fortnight is LITTLE DARLINGS RUBBER STAMPS SHOP (Winner pays shipping if any). Prize will be $15 voucher to the shop! 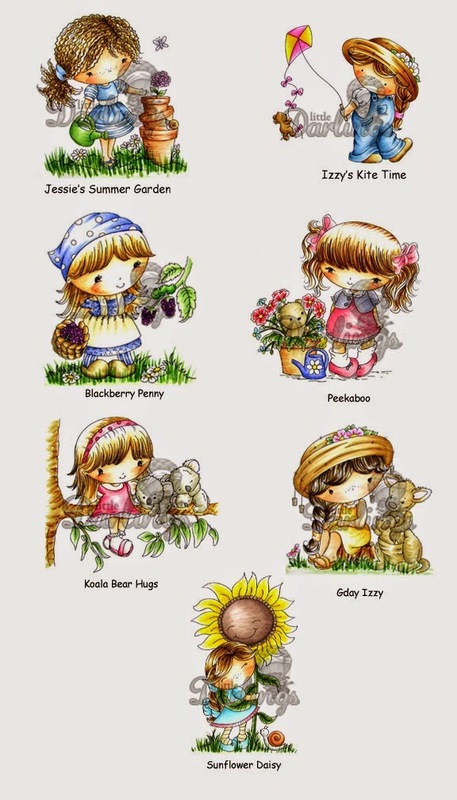 All of Di's CandiBean series rubber stamps are availabe at LITTLE DARLINGS RUBBER STAMPS SHOP and many other retailers. 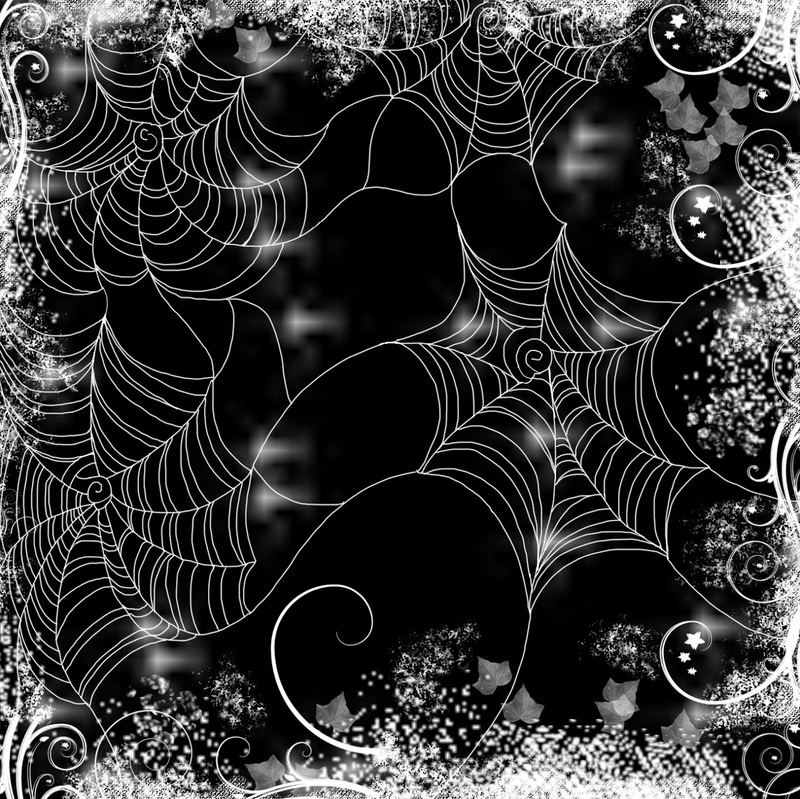 Have a lovely weekend all and cant wait you see all your Mystical creations!!! Just a card to show you i made using my new image 'SWINGIN PENNY', i have drawn this for a very dear friend ( Penny) who has her 30th birthday soon, so before i box it up i thought i would show you all. I have coloured Penny with Copics and used Hobby House papers a little leaf stamp i have in my stash for the trim outside. ( looking at it now i think i should have added Sky!) oh dear!! never mind. Hope you like it and have a great week! 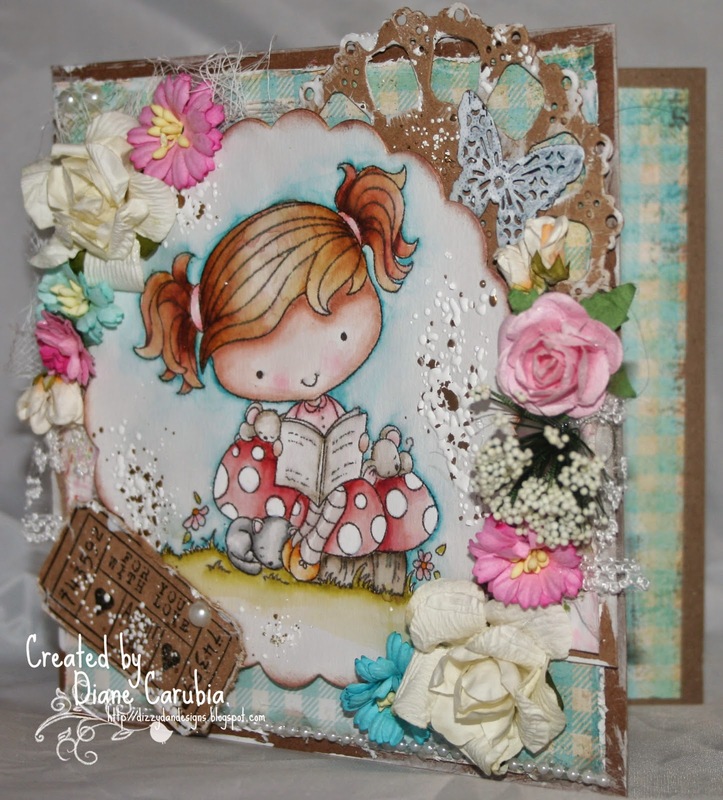 Our new challenge this week is GIRLY! 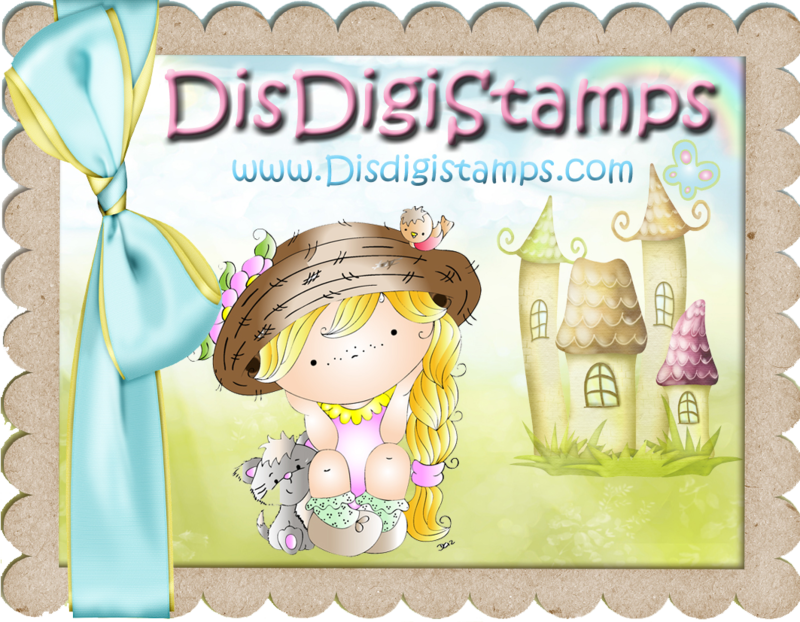 there are tons of wonderful images available at DI'S DIGI STAMPS that will be great on your creations, so you will definitely want to go check it out. Can't wait to see what you make!! My card is made using 'Kitty Surprise' and is for a friend who loves cats!! I have coloured her with my copics and used a LD lovely view die. 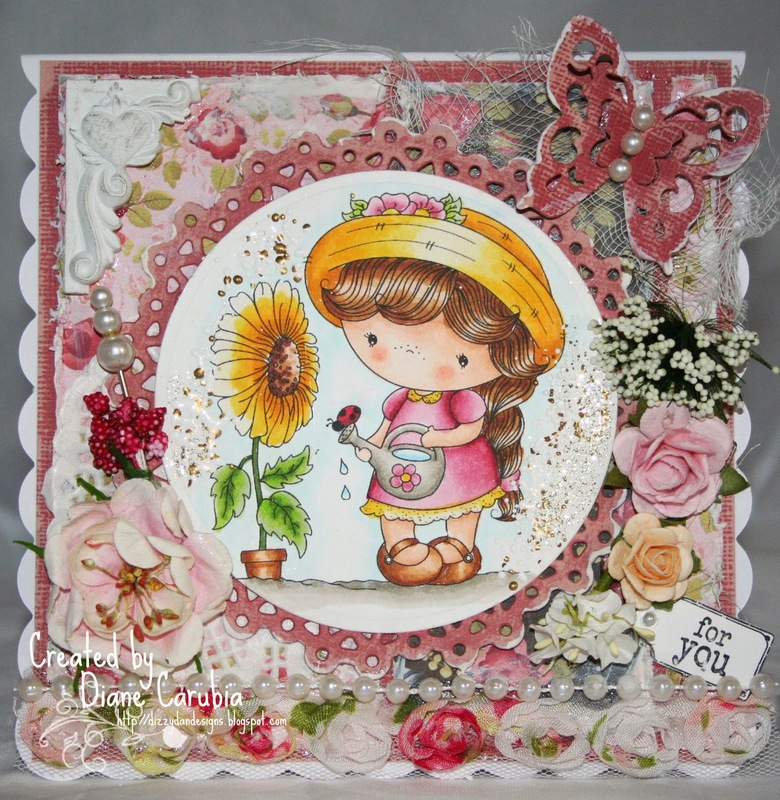 Have a great weekend all, please go and check out all my lovely DT cards, they are awesome as usual!! New Stripes or checks challenge!!! Today is a new challenge over at Disdigis and the theme this time is Checks or stripes. And Angie is generously giving away a $15 voucher to the winner!!! 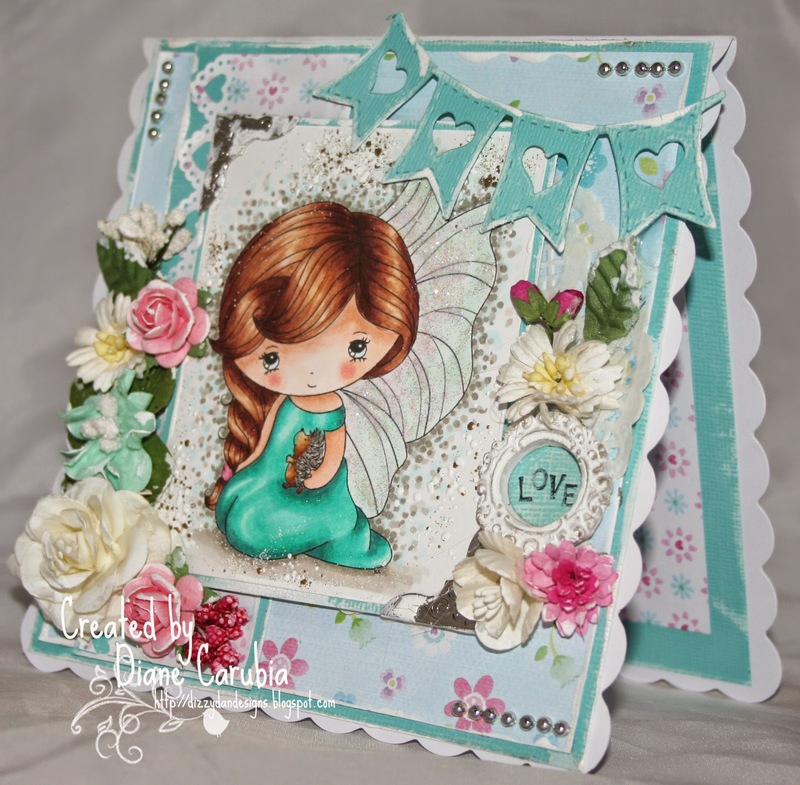 My card is made using my image Snowdrop Daisy although the flowers can be used as any flower you wish, i have coloured her with copics and some stickle glitter, my car was a little rushed as i am still getting myself together after my hols and the kids back to school!! 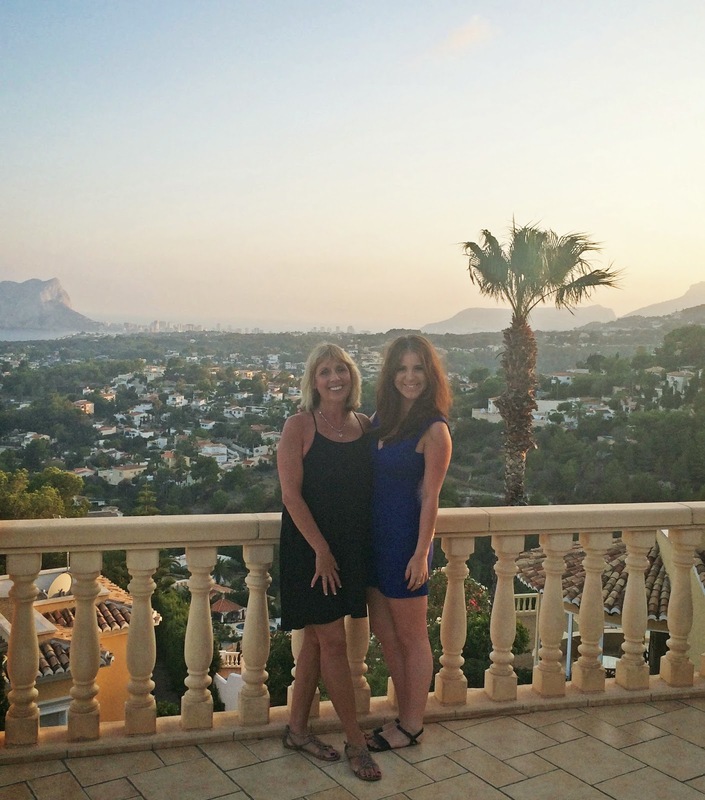 i have posted a photo of my daughter and i just before we are off to have some fine wine and food!! Oh those days fly by so fast, i miss the heat already!!! Hope you have a lovely week and get on over and join in the challenge!!! 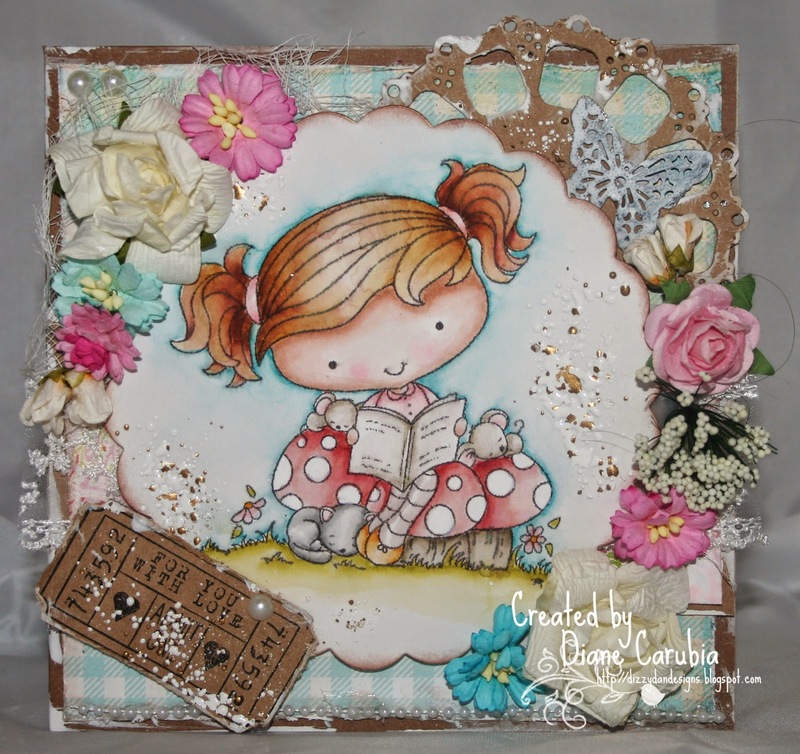 I have coloured her with copics and used a leaf stamp i had in my stash for the border. Sorry for the short post but i have lots to catch up on and to get the kids sorted for the new term ahead! Please join in the challenge and if you use one of my images you can be in for a change to bag 2 of my digi images of your choice! You cant see much lace on my card but it is there! lol! I used the image' Bear Born to Shop' and coloured it with my copics. The sentiment i got free from Julys Creative Stamping magazine, i just love it, it has 4 different sentiments that go inside and also a postage stamp, great feebies!! Our prize this week is from Markerpop and is a voucher of $10. Its a rainy drizzly day here today so i might get some guilt free crafting done without feeling i need to be in the garden!!lol!! Have a great weekend all and get on over and join in the challenge!! Hope you are all well?? 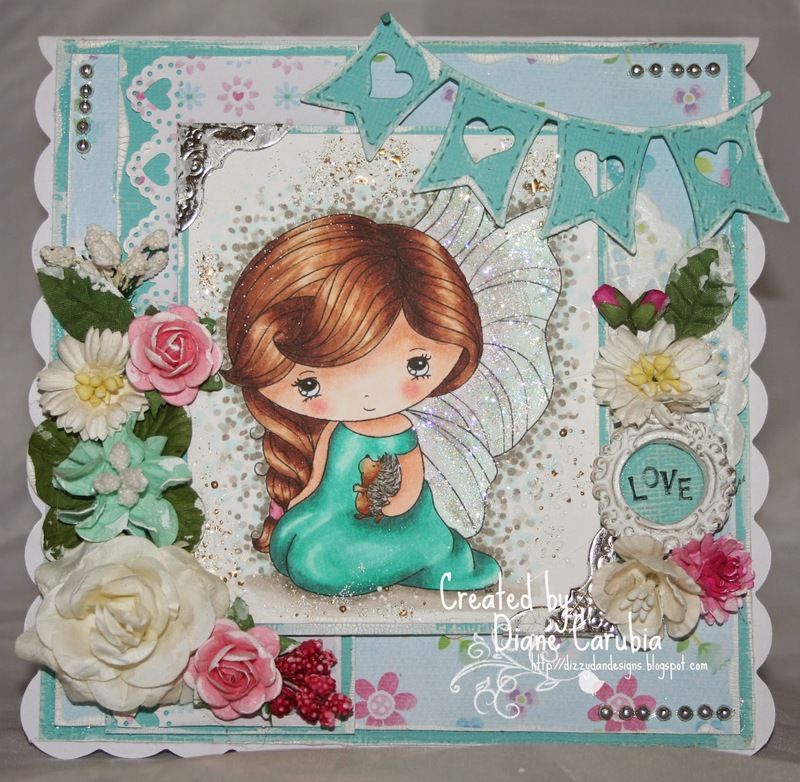 I have coloured her with distress pens, i have also used the 'lovely view ' die from LD and my Flower punches for the flowers, also a whimsey corner die. 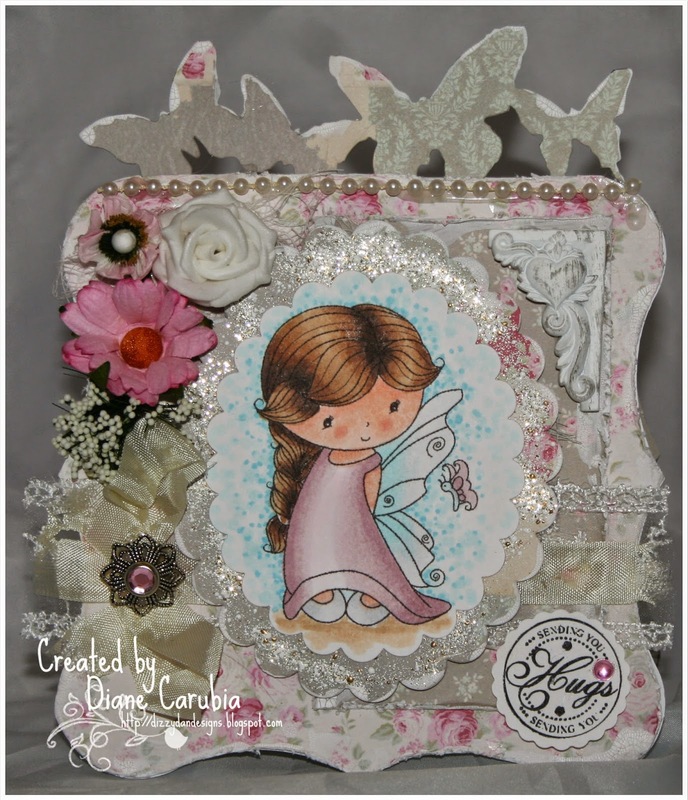 Please pop on over to my challnege blog and check out all the lovely DT gals cards, they are awesome!! This fortnights challenge is SUMMER FUN!!! 3 items of choice!! how fab is that!!!!! 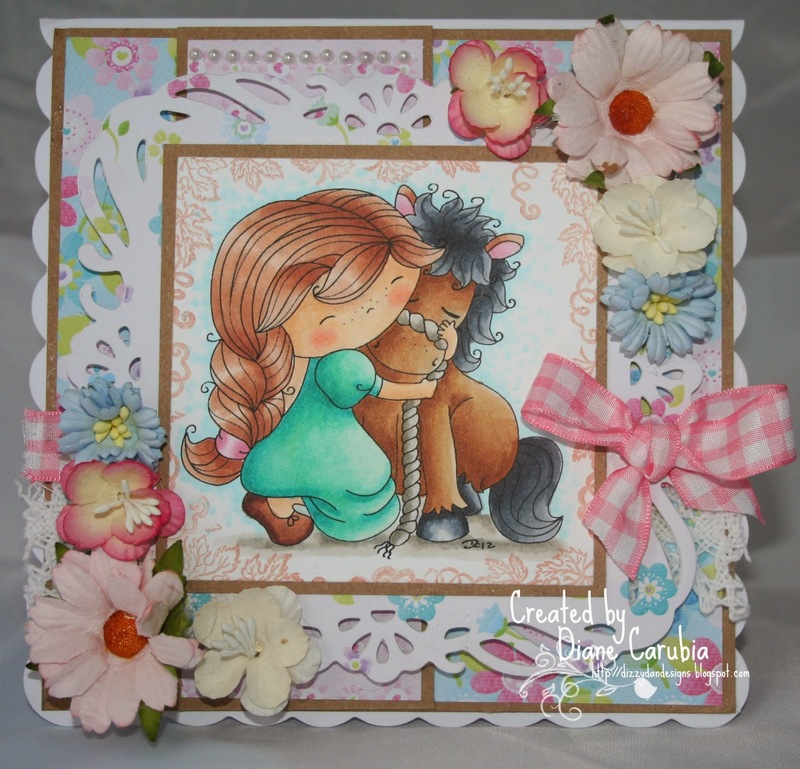 My card is mane using a new image Pennys Summer fun! which i drew especially for the challenge. I have coloured her with copics and used a black watercolour pencil for the dark shadows. Hope you like it and go and check out some fabulous DT work and join in the summer fun!!!!!!! Hope you are all having a lovely weekend, the sun is out here and summer seems to have arrived! This week i want to show you a card ui nade using 'Wendys Storytime'. REcently i have treated myself to a few Distress Markers, i have some distress pads but i dont use them much but i love the distress affect. I love them!!! i still have not got the full technique right and you can still see watermarks but i am sure it will come with practise. 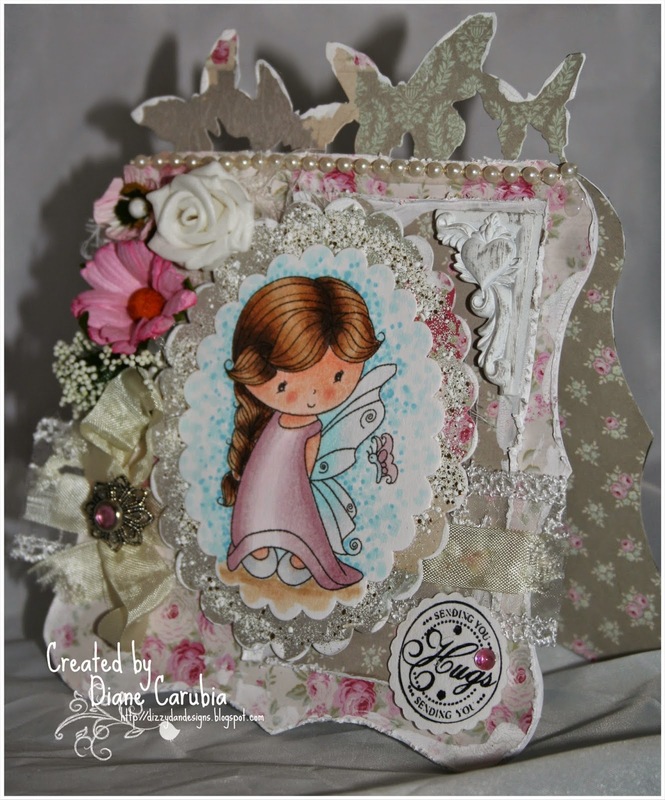 I have a new LD Die 'Lovely View' i bought from 'Dies to Die for' and i just love it!!! The ticket stamp and flowers are from my stash. 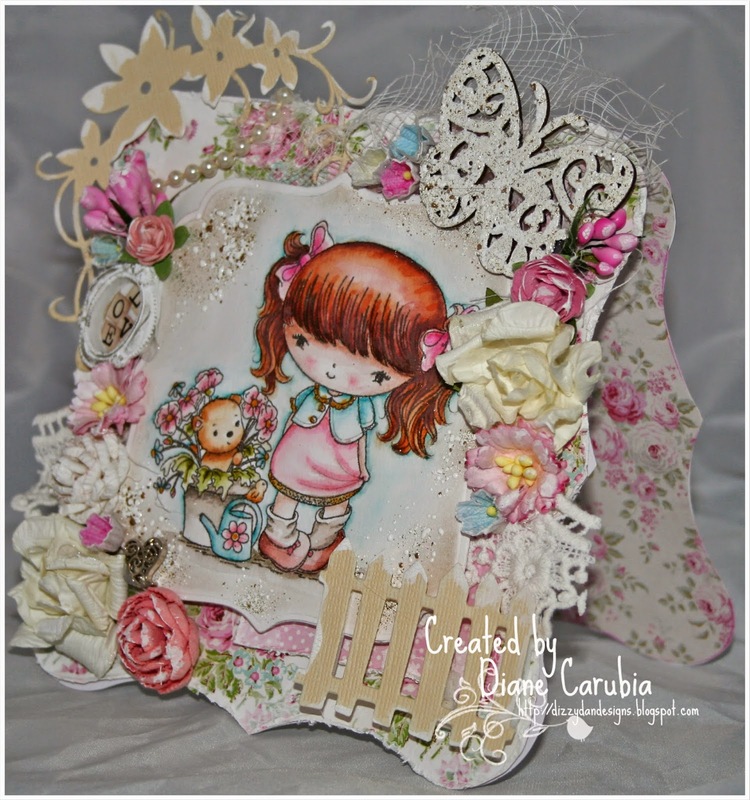 The card is for the Challenge blog and this week it is a 'Lots Of Layers' theme. 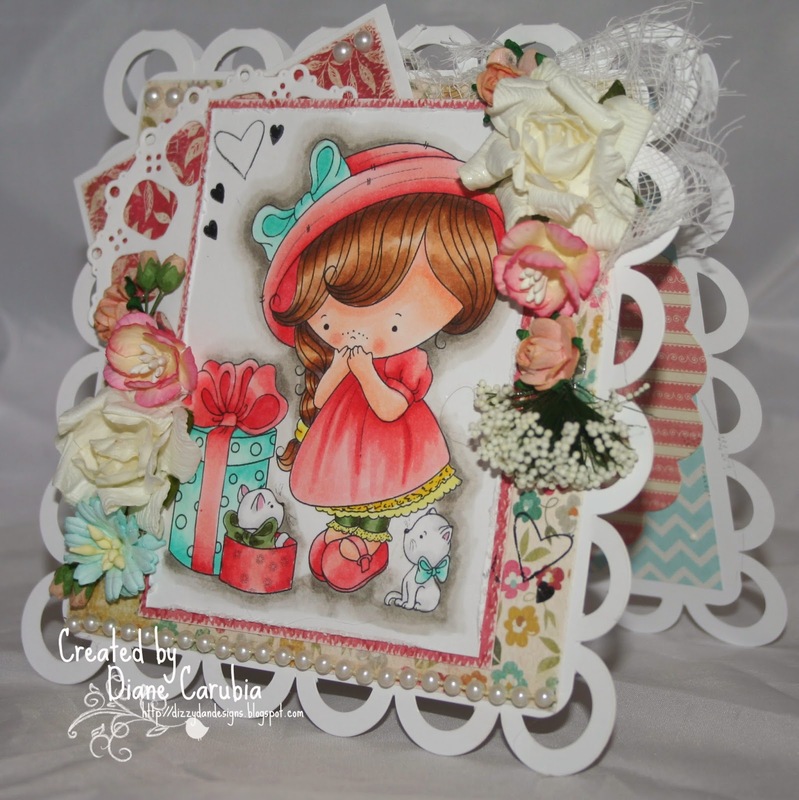 We have a new DT gal Called Rhea and her cards are awesome go and check her out! and a fabulous Gift voucher of $15!!!!!!!!!!! So go and join in the fun!!!! Challenge Time Ribbons and Bows!! I have coloured her with copics and forgot to stickle her wings!!! how daft of me thats the best bit!!!lol!! So i am sure we all know how to make a bow so get entering those fabulous cards!!! NEWSFLASH!!!!!!!! New Candibean 4 release!!!!!!!!!! 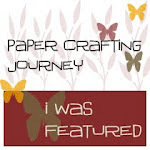 and Blog Hop! Oh I am SUPER Excited!!!!!! 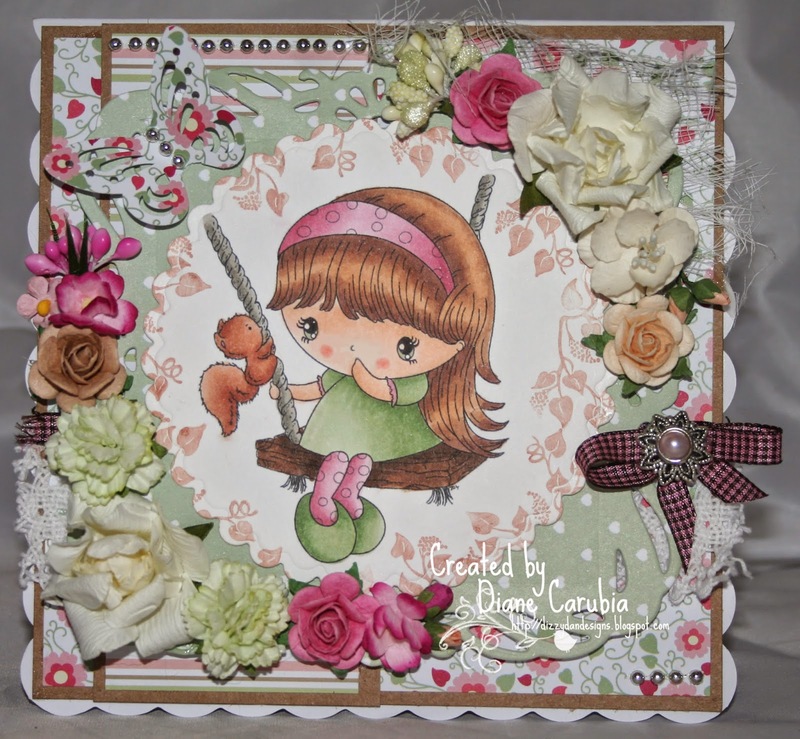 Candibean Release 4 and a Blog Hop Party!!!!! They all now have a super new look, they have a cling foam backing and are contour cut. You will start at Angies blog and keep on hopping from there!!! Go join in the Hop!!!!!! © Diane Carubia. All post are for personal inspiration only and may not be copied for publication or contest submission. please respect copyright laws.